At least seven people were killed and eleven injured on Wednesday in a bomb attack on a police van taking officers to guard polio vaccination teams, officials said. The blast in Sir Dheri, some 30 kilometres north of Peshawar came a day after gunmen killed three polio workers in Karachi. Police said that up to five kilogrammes of explosives were used in the bomb, which was rigged to a bicycle and detonated remotely. “Seven people including six police personnel and a child were killed in a bomb blast in Sir Dheri,” senior police official Shafiullah told AFP. Another senior police official, Sayed Khan, told AFP the van was carrying personnel to a health centre, from where they were to accompany polio vaccination teams for security. “We will continue providing security to polio workers as scheduled by the provincial government,” he said. An official of the district administration confirmed that the police team was on its way to provide security to polio workers when it came under attack. Wednesday was the second day of an anti-polio drive in the area, senior local administration official Tahir Zafar told AFP. 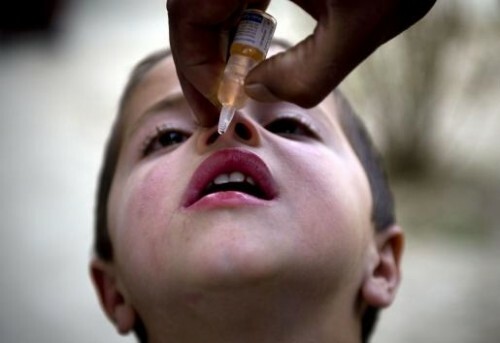 Pakistan is one of only three countries in the world where polio is still endemic, along with Afghanistan and Nigeria. Militant groups see vaccination campaigns as a cover for espionage, and there are also long-running rumours about polio drops causing infertility.